Sinn Fein’s press officer Sean Maguire has been forced to deny that there is a Sinn Fein boycott of the Nolan show, amidst increasing pressure on the party over their aggressive targeting of the media and contrived social media campaigns designed to intimidate journalists. The Sinn Fein campaign against the Nolan Show was orchestrated by Sean Maguire and Conor Maskey, and whipped by Sinn Fein surrogates such as Belfast Media Group’s editor Robin Livingstone and other gullible low level journalists desperate to gain favour with Sinn Fein. Unionist Voice was the first to highlight that Sinn Fein are behind the #BoycottNolan campaign, a fact that was confirmed by Jim Gibney’s astonishing column in the Irish News, which demanded that the Nolan show adopted their style to be “more like Talk Back”, in order that they could be more helpful to the political process. After Sean Maguire’s public denial that Sinn Fein were involved in the targeting of the Nolan Show, prominent senator Niall O’Donnghaile then proceeded to target Frank Mitchell. The UTV man had committed the heinous anti-peace process ‘crime’ of daring to state that young footballers should play for Northern Ireland, the team he supported. This, according to the permanently offended Short Strand man, was in breach of the Belfast Agreement. The trolling of well known sports fan (including passionate GAA supporter) Frank Mitchell continued with scores of republican activists whipping themselves up into a frenzy. Sinn Fein deployed exactly the same method as they used when trying to bully Stephen Nolan into compliance. Ironically the targeting of the Nolan show centred on the fact he dared to have unionists on the show. The republican movement demanded that ‘unacceptable’ unionists were to be censored and inundated the BBC with complaints. At no stage did they make any mention of any nationalist or progressive commentator, or ask for any of those contributors to be banned. This omission gave the game away and exposed that Sinn Fein’s targeting of a free press is not only an attempt to bully the media, but that their campaign has a strong sectarian undercurrent. It is designed to not only force the press into compliance, but to demand the censorship of any unionists voices that do not provide a politically ‘helpful’ analysis, as far as Sinn Fein is concerned. 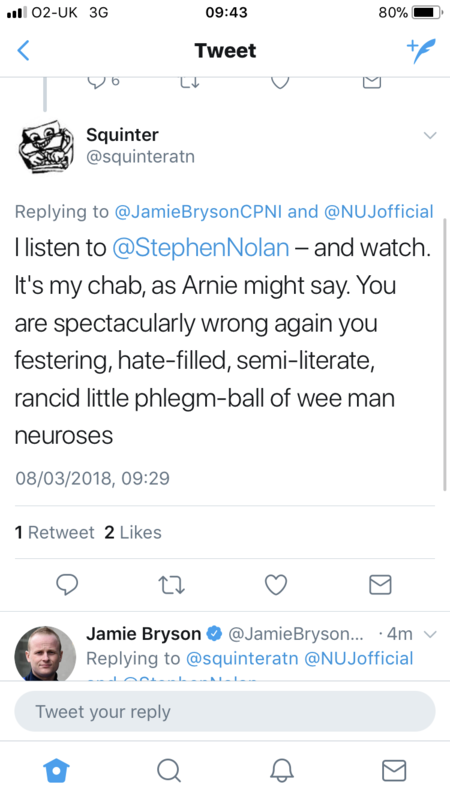 The National Union of Journalists have been silent on Sinn Fein’s targeting of the Nolan show, and other media outlets, and indeed some prominent members have acted as cheerleaders for Sinn Fein’s attack on a free press. A free press is essential and journalists should be free to do their jobs without fear or favour. It is time society stood up to Sinn Fein’s bullying and their wicked attempts to single out and target any journalist or public figure that refuses to buy into their carefully contrived political narrative. 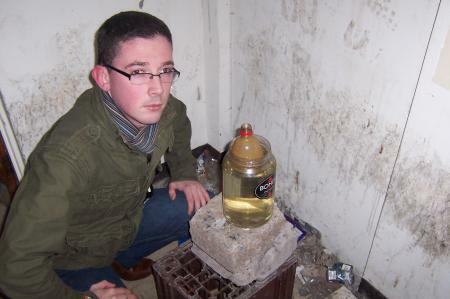 Sinn Fein used their #BoycottNolan campaign as a laboratory to test out bullying tactics. They then moved on to Frank Mitchell. What media outlet will they target next? 143 Responses to "NEWS: SF forced to deny boycott as their targeting of the media gathers pace"
F*ckin’ amazing issues here. I am very happy to see your article. Thanks so much and i am having a look ahead to touch you. Will you please drop me a e-mail? Hi there! Quick question that’s entirely off topic. Do you know how to make your site mobile friendly? My weblog looks weird when viewing from my iphone. I’m trying to find a theme or plugin that might be able to fix this issue. If you have any recommendations, please share. Thank you! I handle such info much. I was seeking this certain info for a very long time. that i suggest him/her to pay a visit this weblog, Keep up the fastidious work. could certainly be one of the best in its niche. Awesome blog! This will be a fantastic site, could you be involved in doing an interview regarding how you designed it? If so e-mail me! Appreciating the time and energy you put into your blog and in depth information you offer. It’s nice to come across a blog every once in a while that isn’t the same old rehashed material. Great read! I’ve saved your site and I’m including your RSS feeds to my Google account. I was just seeking this info for a while. After six hours of continuous Googleing, finally I got it in your website. I wonder what’s the lack of Google strategy that do not rank this kind of informative web sites in top of the list. Generally the top sites are full of garbage. Hi there would you mind letting me know which web host you’re working with? I’ve loaded your blog in 3 completely different web browsers and I must say this blog loads a lot quicker then most. Can you suggest a good internet hosting provider at a fair price? Many thanks, I appreciate it! I’ve been exploring for a little bit for any high-quality articles or blog posts on this sort of house . Exploring in Yahoo I ultimately stumbled upon this web site. Studying this information So i am glad to express that I have a very good uncanny feeling I found out just what I needed. I so much definitely will make sure to don’t put out of your mind this web site and give it a glance regularly. Would you like a receipt? eriacta 100 dosage Cyprus’ finance minister said Tuesday that he’s optimistic international creditors will confirm that the country is sticking to the terms of its financial rescue when they complete their first assessment. After research a couple of of the blog posts in your web site now, and I truly like your approach of blogging. I bookmarked it to my bookmark website record and might be checking back soon. Pls take a look at my website as properly and let me know what you think. all. However think about if you added some great pictures or videos to give your posts more, “pop”! certainly be one of the best in its field. Good blog! The root of your writing while appearing agreeable at first, did not really work properly with me after some time. Somewhere within the paragraphs you actually were able to make me a believer but just for a short while. I still have a problem with your leaps in logic and one might do well to help fill in those gaps. When you actually can accomplish that, I would certainly be amazed. Thanks on your marvelous posting! I genuinely enjoyed reading it, you will be a great author.I will be sure to bookmark your blog and will eventually come back in the foreseeable future. I want to encourage you continue your great work, have a nice morning! What i don’t realize is actually how you are not really much more well-liked than you might be now. You’re so intelligent. You realize thus considerably relating to this subject, made me personally consider it from numerous varied angles. Its like women and men aren’t fascinated unless it is one thing to accomplish with Lady gaga! Your own stuffs outstanding. Always maintain it up! The following time I read a weblog, I hope that it doesnt disappoint me as a lot as this one. I imply, I do know it was my option to learn, but I truly thought youd have something interesting to say. All I hear is a bunch of whining about something that you might fix in the event you werent too busy searching for attention. Hi, i think that i noticed you visited my web site thus i got here to “go back the prefer”.I’m attempting to in finding issues to improve my site!I guess its good enough to use some of your concepts! !